Yes I believe it is something like that. If you were in the middle, it must look like being in the middle of the ocean with no land in sight. The latest EC is consistent with its previous run with the system getting a little closer and slows before approaching the SEQ coast, but still a way off. EC has it as a rather intense system for one so far south. It will be interesting to see what the shear profile will be next week as it's normally quite hostile down here. The upper steering winds will also be a factor. Will this system still be classed as the same low that caused all the flooding? What about if GFS extended happens? Can anyone remember when this low formed? Was it around the 17th January? Will this system still be classed as the same low that caused all the flooding? It is the same low, Simmo; however, as it has never been named, it has not been previously 'classed' as such. Still, it would have an incredible history if it were to come back as a TC. Hopefully, if it does, it will not be as destructive and as deadly as its previous incarnation - except as a 'fish storm'. WITHIN THE NEXT 12 TO 24 HOURS. AVAILABLE DATA DOES NOT JUSTIFY ISSUANCE OF NUMBERED TROPICAL CYCLONE WARNINGS AT THIS TIME. WINDS IN THE AREA ARE ESTIMATED TO BE 25 TO 30 KNOTS. METSAT IMAGERY AT 111930Z INDICATES THAT A CIRCULATION CENTER IS LOCATED NEAR 14.8S 164.0E. THE SYSTEM IS MOVING EAST-NORTHEASTWARD AT 15 KNOTS. UNFAVORABLE (30-40 KNOTS) VERTICAL WIND SHEAR, BUT GOOD POLEWARD OUTFLOW IS SUSTAINING CONVECTION AND FURTHER DEVELOPMENT. SEA SURFACE TEMPERATURES ARE FAVORABLE (28-29C). GLOBAL MODELS ARE IN GOOD AGREEMENT THAT THE SYSTEM WILL DEVELOP INTO A TROPICAL CYCLONE WITHIN THE NEXT 24 HOURS AS THE SYSTEM REMAINS BRIEFLY QUASI- STATIONARY BEFORE MAKING A LOOP OVER VANUATU AND MOVING ON A SOUTH- SOUTHWESTWARD TRACK. MAXIMUM SUSTAINED SURFACE WINDS ARE ESTIMATED AT 25 TO 30 KNOTS. MINIMUM SEA LEVEL PRESSURE IS ESTIMATED TO BE NEAR 994 MB. THE POTENTIAL FOR THE DEVELOPMENT OF A SIGNIFICANT TROPICAL CYCLONE WITHIN THE NEXT 24 HOURS IS HIGH. Hi Simmo FNQ, I believe (and am happy to be corrected if wrong) it formed around 23 Jan just north west of Weipa. THE ANIMATED VISUAL IMAGERY, WHICH SHOW THE LLCC IN AN AREA BETWEEN FLARING CONVECTIVE ACTIVITY. THE INITIAL INTENSITY OF 35 KNOTS IS ASSESSED WITH HIGH CONFIDENCE BASED ON A PGTW DVORAK INTENSITY ESTIMATE IS T2.0 (30 TO 40 KNOTS), SUPPORTED BY ANALYSIS OF THE PREVIOUSLY MENTIONED SCATTEROMETER PASS, WHICH INDICATED A LARGE AREA OF 35 KNOT WINDS ACROSS THE NORTHERN HEMISPHERE OF THE CIRCULATION, WITH SOME EMBEDDED 40 KNOT WINDS. ENVIRONMENTAL ANALYSIS INDICATES THE SYSTEM LIES IN A MARGINALLY FAVORABLE AREA, WITH MODERATE (15-20 KNOT) VWS, STRONG WESTWARD AND POLEWARD OUTFLOW AND WARM (30 CELSIUS) SSTS. THE AUTOMATED VWS ANALYSIS TECHNIQUES ARE DEPICTING UP TO 50 KNOTS OF EASTERLY SHEAR OVER THE SYSTEM, WHICH IS NOT EVIDENT IN THE OVERALL SATELLITE DEPICTION OF THE SYSTEM, SO AN ALTERNATIVE HAND ANALYSIS IS BEING USED TO ESTIMATE THE VWS VALUES AT THIS TIME. THE SYSTEM HAS BEEN TRACKING RELATIVELY QUICKLY TOWARDS THE EAST BUT HAS SLOWED SIGNIFICANTLY OVER THE PAST SIX HOURS AND IS NOW MOVING EAST AT 10 KNOTS UNDER THE STEERING INFLUENCE OF A NEAR-EQUATORIAL RIDGE (NER) TO THE NORTH. OVER THE NEXT 12 HOURS, TC 15P WILL MOVE INTO A WEAK STEERING ENVIRONMENT, AND BECOME QUASI-STATIONARY, SLOWLY DRIFTING GENERALLY TOWARDS THE SOUTHEAST. AFTER TAU 48, A STR BUILDS IN SLOWLY FROM THE EAST, ULTIMATELY DRIVING THE SYSTEM ONTO A SOUTHWARD AND THEN SOUTHWESTWARD TRACK THROUGH TAU 120. TC 15P WILL SLOWLY INTENSIFY THROUGH TAU 48, REACHING A PEAK INTENSITY OF 50 KNOTS, AS MODERATE VWS IS OFFSET BY INCREASING OUTFLOW. AFTER TAU 48, DECREASED OUTFLOW AND SLOWLY DECREASING SSTS WILL COMBINE TO WEAKEN THE SYSTEM THROUGH THE END OF THE FORECAST. NUMERICAL GUIDANCE IS IN STRONG DISAGREEMENT ON THE TRACK OF TC 15P, AND THERE IS THE POSSIBILITY OF INTERACTION WITH INVEST AREA 93P, CURRENTLY NORTH OF FIJI. THE MAJORITY OF THE CONSENSUS MEMBERS AGREE ON THE GENERAL TRACK OUTLINED ABOVE, BUT SHOW SIGNIFICANT VARIABILITY ON THE TRACK SPEED AND TIMING OF THE TURN TO THE SOUTH, WITH NAVGEM BEING THE SLOWEST AND WESTERNMOST, WHILE GALWEM IS THE FASTEST AND EASTERNMOST OUTLIER. THE GFS REPRESENTS THE ALTERNATE SCENARIO, AND TAKES THE SYSTEM WEST THROUGH TAU 48, THEN RAPIDLY MAKES A NORTH LOOP AND DIVES SOUTHEAST TOWARDS CENTRAL VANUATU BEFORE A SHARP TURN TOWARDS THE SOUTHWEST AS THE SYSTEM FUJIWARAS WITH INVEST 93P BY TAU 96. DUE TO THE HIGH UNCERTAINTY IN THE MODELS AND THE POTENTIAL FOR COMPLEX INTERACTION WITH INVEST 93P, THERE IS LOW CONFIDENCE IN THE JTWC FORECAST. MAXIMUM SIGNIFICANT WAVE HEIGHT AT 120000Z IS 12 FEET. EC still persisting with an eventual track back towards SEQ. So much will likely change in the next 10 days however. ACCESS G not bringing the TC into BOM area of responsibility at all this week . Right out at 167e 23s at ACCG g T + 162 hrs. Exact opposite to the forecasting models last week where AccessG was dreaming of a coasthugger & eventually EC was way closer with its forecasting. So EC now brings it on a broad track towards SEQ this morning, update coming soon I hope. Waaay out there timewise though. Trust EC more than AccessG though even this far out. If only GFS's latest run could verify. The southern half of eastern Qld would get a drink. And GFS-FV3 next gen model showing a significant change as well. Too far out though - at best speculation at present I think! Quite amusing to see a well known facebook page posting about this one with the line "we never jump at the first chance t=just to spread hype or fear", suuure they don't! Wow, 960 over Mackay, naah, wont happen. EC Is looking quite nice still and nice inland upper trough dragging in the the TC with Ridging to the South of it. Also SSTs are sitting nice and pretty about 26-27 sitting all the way to the East of Batemans Bay. Anyways that's my take. That inland upper trough is whats going to take it to the graveyard in this morning's EC run. EC moves it faster south and gets captured more easily by the upper trough. GFS has it much further north, less likely to get fully captured and continues a more westward trajectory. This system got named TC Oma by Fiji overnight. Thanks for the heads up CF! Most people know that the BoM has responsibility for naming and issuing warnings re TCs out to 160E. However, what isn't as well known is that the BoM has responsibility for forecasting and re-issuing warnings for the High Seas out to 170E (North Eastern High Seas). The latest High Seas forecast from Melbourne for this area is below, which includes a re-issuing of the gale warning for TC Oma from Nadi. Wind gusts can be a further 40 percent stronger than the averages given here, and maximum waves may be up to twice the height. Refer to latest warnings for boundaries of affected areas and type of weather system. 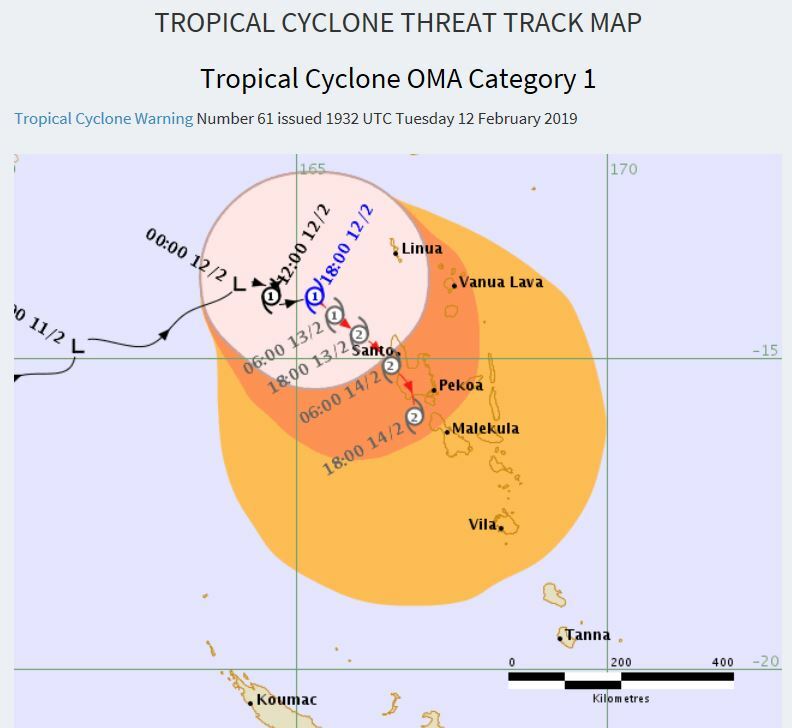 Tropical Cyclone Oma 986hPa near 14.0S165.3E at 121800UTC. Forecast 14.8S165.4E at 140000UTC. Monsoon Trough 17S145E to Tropical Cyclone Oma to 15S170E. Westerly quarter winds 15/25 knots increasing to 20/30 knots east of 150E and tending clockwise within 360nm of Tropical Cyclone Oma. Winds increasing to 25/33 knots within 120nm of warning area. Moderate to rough seas grading to very rough within 120nm of warning area. Low to moderate swell. Southeasterly quarter winds 20/30 knots with moderate to rough seas becoming clockwise within 360nm of Tropical Cyclone Oma. Winds increasing to 25/33 knots within 120nm of warning area with very rough seas. Winds not exceeding 20 knots west of line 16S154E 25S158E with slight to moderate seas. Low to moderate swell. remainder north of monsoon trough. Isolated showers remainder. Visibility reducing below 2nm in precipitation. 5 registered (Knot, ScubaSteve, 3 invisible), 64 Guests and 3 Spiders online.